Regulate the immune system, especially in allergy conditions and to remove wind-heat. 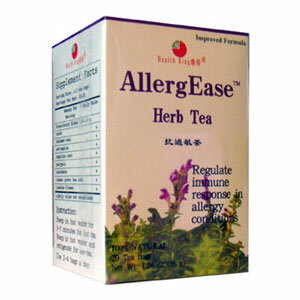 AllergEase Herb Tea is made of wild scutellariae radix, solomon seal, astragalus, angelica root, polygala, Eleuthero, tender green tea leaf and jasmine flower. They povide baicalin, baicalein, flavone, sitosterol, vitamin B1, wogonoside, fatty acid, archiin, etc. Chinese medicine uses them to regulate the immune system, especially in allergy conditions and to remove wind-heat.